How to draft a polite Job Rejection Letter to a candidate that was not selected after the job interview took place? 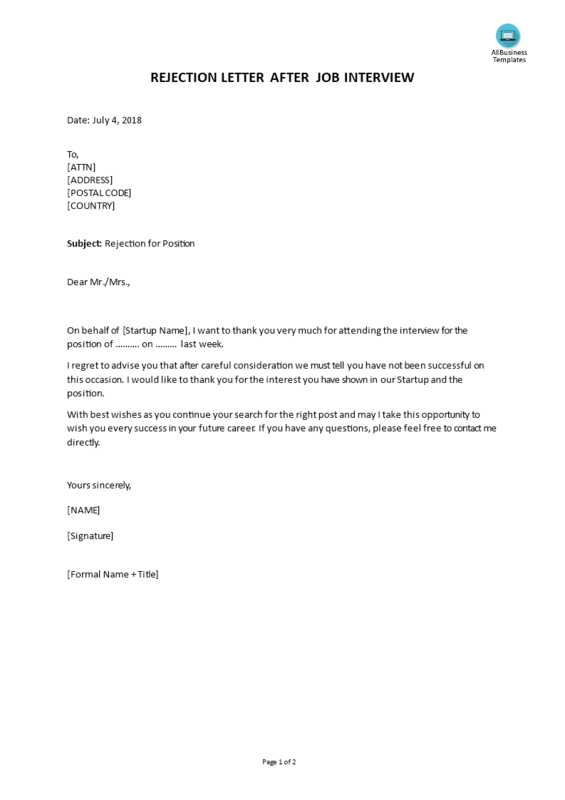 Download this Rejection Letter for job position template now! We support you and your company by providing this HR Job Rejection Letter HR template, which will help you to make a perfect one! This will save you or your HR department time, cost and efforts and help you to reach the next level of success in your work and business! This HR Job Rejection Letter has ways to grab your reader’s attention. They are crafted by HR professionals, are intelligently structured and easy-to-navigate. Pay close attention to the most downloaded HR templates that fit your needs. Download this Human Resources HR Job Rejection Letter template now!